In multiples of 20 these coins will ship in tubes. وجه العملة تمثال نصفي لحقبة ما قبل اليونانيين مع عمود وخوذة وكلمة " أرغيراسبيس "
تمثال نصفي لحقبة ما قبل اليونانيين مع عمود وخوذة وكلمة " أرغيراسبيس "
1 أوقية 2013 قطعة فضية لمحارب مقدوني أرغيراسبيس أو ذو التروس الفضية The Argyraspides, so called because they used silver plated shields, were a division of the Macedonian Army under Alexander the Great. They were hand picked men commanded by Nicanor, son of Parmenion and were held in high regard by Alexander. Originally they were a type of soldier called Hypaspists or "shield bearers" They were made up of older men but they were one of Alexander the Great's most feared units. Regarding this coin, the coin creator Chris Duane says: "The short story behind it is that throughout all of history and 2/3 of the world today, 1/10 of an ounce of silver represents 1 days labour. 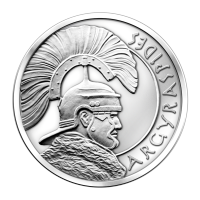 Roman soldiers were paid a denarius for each day they served the Roman Legion. In Sun Tzu's the Art of War a 10,000 man army could be bought for a 1,000 ounces of silver a day. And even 2/3 of the world today lives off of less than $2 a day."